A driver leaving a shopping center struck and killed Paul J. Gunia, 61, in the Belmont Terrace neighborhood on the Northwest Side and was not cited. 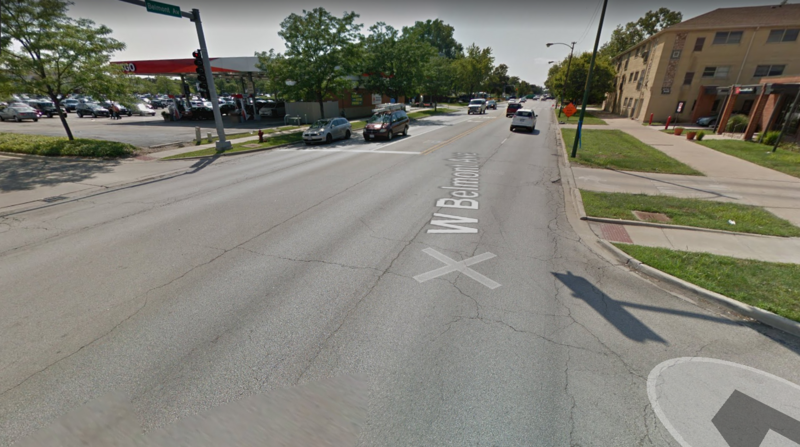 At about 5:40 p.m. Gunia was crossing northbound in the 8300 block of Belmont Avenue, according to Officer Ronald Westbrook from Police News Affairs. The Thatcher Woods shopping center is on the south side of the block. The motorist was leaving a parking spot and heading north to turn left when he struck Gunia, Westbrook said. The victim was taken to Loyola University Medical Center in Maywood and pronounced dead at 4:24 p.m. last Wednesday, according to the Cook County medical examiner’s office. John did you notice that the NW corner has a ramp, but the because of the wide apron the SW corner has none? That’s why there was no painted crosswalk. I wasn’t given the exact location of the crash — the screen shot I included was to provide a general idea of the street layout on that block. Yah I understand. Just pointing out the poor design having a sidewalk ramp to nowhere. My sympathy to the family and friends of Paul Gunia.